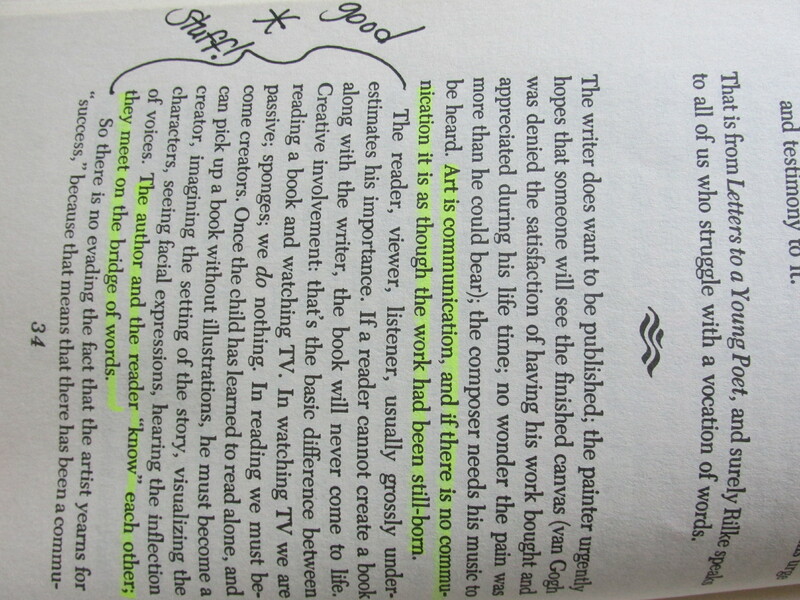 My used copy of Madeleine L’Engle’s Walking on Water is annotated in another hand. A very upright, clear hand. This reader is opinionated. She uses thick black ink, sometimes shimmery teal. She– or he, if the penmanship and colorful pens have me fooled– argues and agrees with L’Engle, littering the margins with asterisks, capitalized agree! and disagree, underlined phrases and lengthy verses of scripture which often counter L’Engle’s own citations from the bible. I open the book and find a lively discussion in progress. I had no idea when I bought it how loud it would be inside. I’m feeling a little crowded as I read. I have the sense of this reader hanging over my shoulder, telling me what I should think. I’m compelled to highlight in pink, the one color the loud reader doesn’t use. I write my name in the bookflap, and for good measure, note that the book was annotated when I bought it. Hush, I say to the marginalia. I’m reading.